Some thoughts on a Sunday evening! This is a reproduction of a Coignard painting "Perturbation"
I wanted to share some thoughts with you this evening on investing. This is not about any particular stock but about the whole process of selecting stocks, making decisions, and reducing the tremendous stress in the process. Needless to add, as I always like to do, I am an amateur investor, so please consult with your professional investment advisors before making any investment decisions based on information on this website! I chose this picture tonight because I want to comment about the thinking process that goes into decisions. After many years of guessing about what stock is likely to rise and what stock may fall, and when to sell, and when to add more, I have decided that the best approach is to 'put your ear to the ground' and listen to what the market is telling you. I have many friends who dabble in the market. They give it a great deal of thought and try to anticipate the next big move. Sometimes they are right, and I wish them well. But after years of doing the same thing, I stop "trying" to make decisions. I let the decisions come to me. I have written before about this "Zen" approach to investing. And I believe it is a very important part of a successful investor. Avoiding the anticipation but being in touch with investment sentiment. "That is how I first came to take an interest in the message of the tape. The fluctuations were from the first associated in my mind with upward or downward movements. Of course there is always a reason for fluctuations, but the tape does not concern itself with the why and wherefore. It doesn't go into explanations. 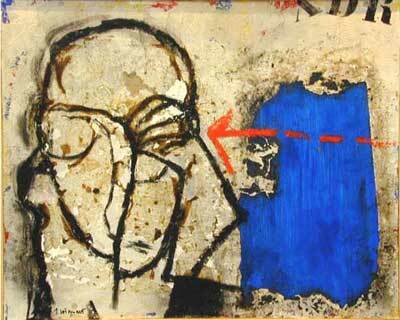 I didn't ask the tape why when I was fourteen, and I don't ask it to-day, at forty. The reason for what a certain stock does to-day may not be known for two or three days, or weeks, or months. But what the dickens does that matter? Your business with the tape is now--not to-morrow. The reason can wait. But you must act instantly or be left." What this book tells us is that studying the market entails observation. It doesn't make you less smart that I am not asking you to anticipate. I think it is enough that we learn to observe. To "read the tape" so to speak. It is that reason why I start with the % gainers looking for the stocks on the move. I don't always know why they are moving, but I start there and try to sort through them to find the ones that have fundamentals that might warrant continued strength. I believe it is a good approach. That doesn't mean there aren't better ways to pick stocks. You could study market trends and be an astute technician, but I don't think that is necessary. Just being a good observer is strong medicine. After starting there, pitch in your intellect and sort through the candidates to find the stocks that are working. In the same way, it is wise to listen to your own portfolio talking to you! When stocks begin to be sold on bad news, sit on your hands, don't re-invest, avoid compounding your losses. But as stocks do well and hit sales on good news, it is wise once again to expand your exposure to equities and add positions to your portfolio. Just some thoughts on investing tonight that I wanted to put down on paper and share with you the reader. Listen to your fellow investors, they will tell you about the next sure thing, the investment that will rocket higher, and consider that this might not be the rational approach to investing. Instead, sit yourself down and observe, watch the market, see what stocks are moving higher, and selectively pick from among those! Have a great week investing everyone! And to all of the victims of Rita and Katrina, and I include my own family and friends among them, my thoughts are with you. In order to find out if all of my stock picks even work, are profitable, and that the reasons I selected them make sense, I have been reviewing past stock picks on about a rolling one year basis. Unfortunately, some weekends my life is so busy, I do not get to the blog, and thus, my trailing 52 weeks is now extending to about 60 weeks out. Please remember that past performance is not a guarantee of future performance! Just because a stock has done well does not mean that it will continue to do well! Furthermore, these "picks" are not all stocks that I own. In fact, the stocks that I own are listed in my "Trading Portfolio". These are just stocks I have discussed and are potential candidates for purchase imho. Enough of that. Let's get to the review. I have things to do today! Fortunately, the week of July 19, 2004, was rather quiet, as I "picked" only two stocks that week! On July 19, 2004, I posted Stryker (SYK) on Stock Picks at $47.95. 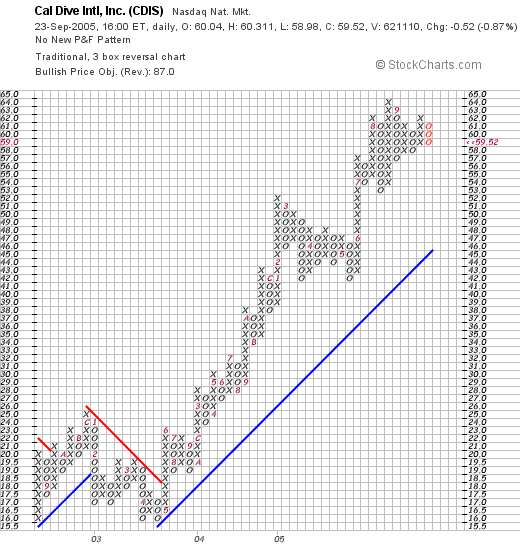 SYK closed at $50.30 on 9/23/05, for a gain of $2.35 or 4.9% since being listed on the blog. On July 19, 2005, Stryker reported 2nd quarter 2005 results. Net sales climbed 16.8% to $1.2 billion, over prior year's $1.04 billion net sales figure. Net earnings jumped 20.7% to $184.3 million from $152.7 million last year, and diluted earnings per share climbed 21.6% to $.45/share up from $.37/share the prior year. Overall a solid picture from Stryker! On July 25, 2005, Florida Rock Industries announced 3rd quarter 2005 results. Consolidated sales grew 25% to $313.5 million from $251.6 million in the prior year same period. Net income climbed to $45.9 million from $33.1 million last year, and diluted earnings per share grew 38% to $.69 from $.50 the prior year same period. This was a solid quarter from FRK! My only regret is that I don't own any shares! With the fabulous performance of Florida Rock and the satisfactory performance of Stryker, these two stocks had an average performance of a gain of 56.1% over this period. Thanks so much for stopping by and visiting! If you have any questions or comments, please feel free to leave them right here on the blog or email me at bobsadviceforstocks@lycos.com. I cannot answer all of my emails, but I try to answer as many as possible with comments published right on the website. Hello Friends! Thanks so much for stopping by and visiting my blog, Stock Picks Bob's Advice. As always, please remember that I am an amateur investor so please remember to consult with your professional investment advisors prior to making any investment decisions based on information on this website. It is hard to believe that it is once again the weekend and time to review some past picks and positions. I was in Target the other day with one of my kids who told me "Gee they have the Halloween stuff out already, it was just Halloween!" This weblog is a diary of two things: stocks that I have looked at without purchasing, and my actual purchases in my trading portfolio. I have been going alphabetically through my 25 positions, and am currently up to Cal Dive (CDIS). On November 3, 2004, I purchased 200 shares of Cal Dive (CDIS) at $38.158 and immediately posted the trade on Stock Picks. Later that evening, I wrote up a full review of CDIS on Stock Picks. Cal Dive has been a good performer in my portfolio. I sold my first partial position, 50 shares representing 1/4 of my holdings, on 2/25/05 at $49.87, representing a gain of $11.71 or 30.7%. If you are familiar with my trading strategy, I sell my losers quickly at an (8)% loss, but sell my gaining stocks slowly at 30, 60, 90, 120, 180, etc. gain points. On August 1, 2005, I sold my second 1/4 position, this time only 37 shares representing approximately 1/4 of my remaining 150 shares, at $60.84, representing a gain of $22.68 or 59.4%. Where would I sell next? Since I have sold this stock twice, I would only let it retrace 50% of the highest gain, that is I would again be selling all remaining shares at the 30% gain on the downside, or at about a price of $49.61. On the upside, I would plan to sell 1/4 of my remaining shares or about 28 shares if an when the stock hits a price of approximately $72.50. Meanwhile, I wait patiently :). CDIS closed at $59.52 on 9/23/05, down $(.52) or (.87)% on the day. Cal Dive (CDIS) has turned out to be a "hurricane stock pick" with both Katrina and Rita barrelling through the Gulf of Mexico making a mess of offshore oil equipment/facilities. I did not purchase this stock because of this possibility. I used my usual technique of looking for stocks with strong daily momentum, great earnings and revenue growth, a good Morningstar evaluation consisting of steady revenue and earnings growth over the past five years, positive free cash flow, and a good balance sheet. Let's take another look at Cal Dive! According to the Yahoo "Profile" on CDIS, the company "...operates as an energy services company in the Gulf of Mexico, and in the North Sea and the Asia/Pacific regions. It offers a range of marine contracting services, such as marine construction, robotic services, manned diving, and decommissioning services." On August 2, 2005, CDIS reported 2nd quarter 2005 results. Revenue grew to $166.5 million from $127.7 million in the second quarter last year. Net income climbed to $26 million, from $18.2 million the prior year same period. On a diluted earnings per share basis, earnings came in at $.65/share, up from $.47/share in the same quarter last year. Of some concern is the risk that this Gulf of Mexico, Houston-based company faces to its own assets with the hurricanes. On September 1, 2005, CDIS reported on Katrina damage and noted that preliminary reports "...revealed no significant damage from Hurricane Katrina to its Marine Contracting assets and offshore production facilities." I do not see any news yet on Hurricane Rita and whether CDIS incurred any damage. 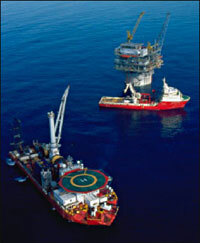 However, CDIS is involved in the repair and salvage of offshore assets and should be facing significant business opportunities as the offshore oil business in the Gulf responds to the hurricanes (imho). Reviewing the Morningstar.com "5-Yr Restated" financials, we can see the beautiful progression in revenue from $181.0 million in 2000 to $621.1 million in the trailing twelve monts (TTM). Earnings have grown steadily (except for a dip in 2002) from $.72 to $2.51 in the TTM. Free cash flow turned negative in the TTM on the back of a large $244 million capital spending. Currently at $(5) million, this is a "negative" in my book, but it is reassuring to see the dynamic growth in "Operating Cash Flow". Looking at the balance sheet, we can see that the cash stands at $199.7 million, plenty to pay off all of the $157.1 million in current liabilities. In addition, CDIS has $165.7 million in "other current assets", enough to make a nice dent in the $768.5 million in long-term liabilities. We can see what looks like a gorgeous looking chart with the stock initially trading between a range of $15.50 to $25, breaking through a resistance line at $18 in May, 2003, and trading steadily higher for the past 2 1/2 years! Looks quite strong to me! Anyhow, that's another real stock holding for me. It doesn't mean it is better than my other stock picks that I discuss. I can tell you about lots of those other stocks that turned out better than anything I actually purchased. I just want to share with you my current holdings, which forces me to take a closer look at them as well! Thanks so much for stopping by and visiting. I hope all of this discussion is helpful for you, I know it is good for me! If you have any questions or comments, please feel free to leave them right on the blog or email me at bobsadviceforstocks@lycos.com. Looking through the list of top % gainers on the NYSE this afternoon, I came across Thor Industries (THO), which closed at $33.41, up $1.58 or 4.96% on the day. I do not own any shares of Thor (THO) nor do I own any options. In fact, I first posted Thor on Stock Picks on February 10, 2004, when it was trading at $33.86. Thor is actually $(.45) lower than when I posted the stock for a loss of (1.3)% since posting. The stock has really gone nowhere since I first posted it a year-and-a-half ago! According to the Yahoo "Profile" on Thor, the company "...engages in the production and sale of recreation vehicles, and small and midsize buses in the United States and Canada. 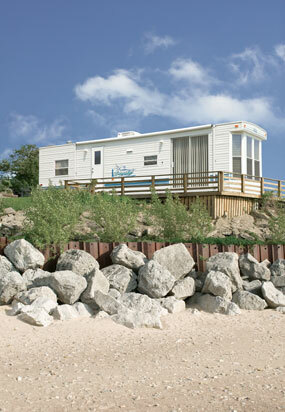 The company opoerates in three segments: Towable Recreation Vehicles, Motorized Recreation Vehicles, and Bus." The maker of recreation vehicles and mid-size buses said many of the orders came from dealers who are selling to Hurricane Katrina evacuees. 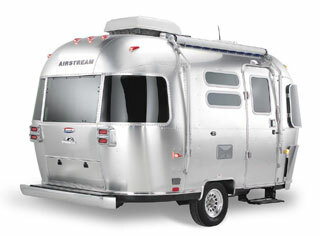 Thor posted towable orders of $83 million in September last year, and reported total sales of $2.19 billion for 2004. Clearly, THO and other similar RV manufacturers may end up being beneficiaries of the tragedy befalling many Americans in Texas, Louisiana, Mississippi and Alabama; Americans in desperate need for housing. Many of you have come to this website in search of a Katrina stock pick, or a Rita stock pick, or just for a hurricane stock pick. This company may well fit the bill! 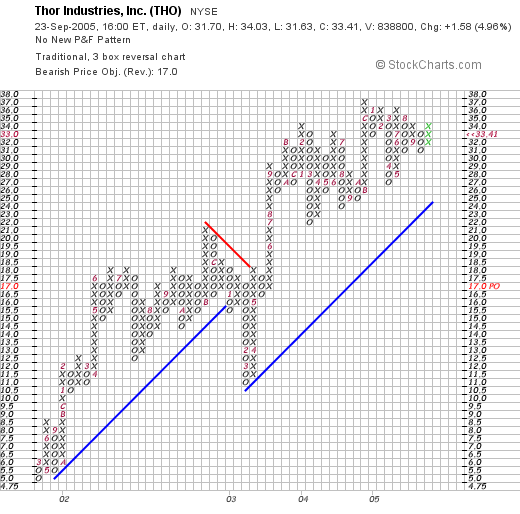 On June 2, 2005, Thor Industries (THO) reported reported 3rd quarter 2005 results. For the third quarter ended April 30, 2005, Net Sales increased to $728.7 million, up from $645.7 million the prior year same quarter. Net income for the quarter grew 4.5% to $33.0 million, up from $32.8 million the prior year. On a diluted eps basis, earnings increased only $.01 to $.58/share up from $.57/share in the same quarter last year. Looking at the Morningstar.com "5-Yr Restated" financials, we can see that except for a small dip in revenue from $900 million in 2000, to $800 million in 2001, revenue has grown steadily to $2.5 billion in the trailing twelve months (TTM). Again, except for a dip in earnings from $.74/share in 2000 to $.56/share in 2001, earnings have also been steadily growing to the $2.11 level reported in the trailing twelve months. The company pays a small dividend which has increased from $.02/share in 2000 to $.12/share in the TTM. Free cash flow which dipped from $126 million in 2002 to $18 million in 2003, has increased to $67 million in the TTM. The balance sheet, as reported by Morningstar, looks strong with $127.5 million in cash and $389.8 million in other current assets. Balanced against this is the $246.9 million in current liabilities and the 'smallish' $11.0 million in long-term liabilities. Looking at Yahoo "Key Statistics" for THO, we find that the market cap is a mid cap sized $1.89 billion. The trailing p/e is downright reasonable at 15.84 with a forward p/e (fye 31-Jul-06) of 13.42. The PEG (5 yr expected) is 0.93. Within the Recreational Vehicles Industrial Group, according to Fidelity.com website, we can see that Thor is reasonably priced in terms of price/sales ratios within its industrial group. Topping off the list of stocks ranked by price/sales, is Harley Davidson (HDI) at 2.7, then Polaris Industries (PII) at 1.1, Winnebago (WGO) at 0.9, followed by Thor (THO) at 0.7, and Monaco Coach (MNC) at 0.3. Checking other Yahoo statistics, we can see that there are 56.61 million shares outstanding. Currently, as of 7/12/05, there were 4.88 million shares of stock out short, representing 15.4 trading days of volume. As noted above, THO does pay a small dividend of $.20/share yielding 0.60%. The last stock dividend was a 2:1 split on 1/27/04. We can see what actually a fairly strong chart of a stock that climbed from $5.00/share in February, 2001, to an intermediate high at $21/share in August, 2002. The stock broke down to a new support level at $10.00, only to resume its climb to the $33.41 level. So what do I think? Well, let's review: latest earnings was strong, the past five years have been solid performers for this stock, valuation is reasonable, free cash flow is positive and the chart looks strong. Again, this might be a good hurricane pick with the massive damage to housing throught the four state region. Now, if I only had some available cash to buy something! In fact, I am at my 25 position goal, and shall not be buying any additional shares until I sell a stock to get back down to 24 positions, then make another purchase on the back of a partial sale of one of my holdings in my trading account at a gain. Thanks again for stopping by! Please be sure to leave a comment right on the blog or email me at bobsadviceforstocks@lycos.com. Hello Friends! Thanks so much for visiting my blog, Stock Picks Bob's Advice. As always, please remember that I am an amateur investor, so please remember to consult with your professional investment advisors prior to making any investment decisions based on information on this website. Prior to getting to the stock pick, I must share with you my growing alarm about the horrendous damage Katrina and the imminent approach of hurricane Rita, a second category 4-5 hurricane! I find it hard to believe a mega-city like Houston could possibly be evacuated. 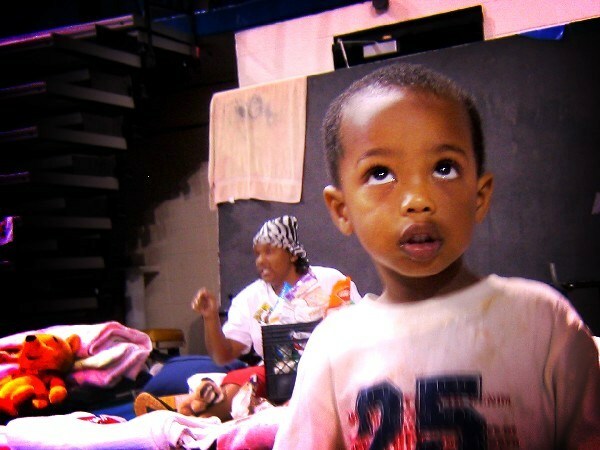 "Thomas, whose family was forced from home by Hurricane Katrina, at the shelter at Southern University in Baton Rouge. (Photo: Courtesy of Robert Terrell, flickr.com/photos/ratterrell/) "
Please consider a donation to the International Rescue Committee, an organization working to assist displaced peoples since 1933. For more information on the IRC, visit their website. While many of us are searching for great Katrina Stock Picks or Rita Stock Picks, let's not forget the people who are victims of these disasters, while we also consider the opportunities that redevelopment will provide! I was looking through the list of top % gainers on the NASDAQ today and I saw that Comtech Telecommunications (CMTL) had made the list. I do not own any shares nor do I have any options on this stock. CMTL closed at $40.65, up $3.37 or 9.04% on the day. According to the Yahoo "Profile" on Comtech, the company "...engages in the design, development, production, and marketing of products, systems, and services for communications solutions. 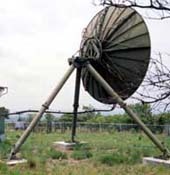 It operates through three segments: Telecommunications, Transmission, Mobile Data Communications, and RF Microwave Amplifiers." I first posted Comtech on Stock Picks on December 9, 2003, when CMTL was trading at $30.89. CMTL split 3:2 on 4/5/05, making my effective stock pick price actually $20.59. Thus, with the stock closing today at $40.65, that represents a gain of $20.06 or 97.4%. What drove the stock higher today was the 4th quarter 2005 earnings report which was announced today just prior to the opening of trading. For the quarter ended July 31, 2005, net sales climed $39.2 million or 66.3% to $98.3 million from $59.1 million last year same quarter. Net income came in at $11.0 million or $.42/diluted share, up strongly from $6.1 million or $.25/diluted share in the previous year. Looking at the Morningstar.com "5-Yr Restated" financials, we can see the rapid growth in revenue from $66.4 million in 2000 to $268.7 million in the trailing twelve months (TTM). Earnings have improved from a loss of $(.31) in 2000 to $1.28 in the trailing twelve months. Free cash flow has also grown nicely from $6 million in 2002 to $59 million in the TTM. Looking at the Morningstar-presented balance sheet, we can see that the company is quite solvent with $205.3 million in cash--enough to cover both the $72.4 million in current liabilities and the $110.4 million in long-term liabilities combined, with cash left over. In addition, the company has $95.1 million in other current assets. Looking at Yahoo "Key Statistics" on CMTL, we can see that this company is a mid-cap stock with a market capitalization of $883.04 million. The trailing p/e is a bit rich at 31.22. Forward p/e (fye 31-Jul-06) is slightly better at 27.10. The PEG ratio is a bit steep as well at 1.80. According to the Fidelity.com brokerage research, CMTL is a member of the "Communications Equipment" industrial group, and is priced midway in the group. At the top of the group, Qualcomm (QCOM) sports a price/sales ratio of 14.1. This is followed by Adtran (ADTN) at 5.4 and Comtech (CMTL) at 3.8. Tellabs (TLAB) comes in at 2.7, Nokia (NOK) at 1.7, and Motorola (MOT) is actually listed at "0". Referring back to Yahoo, CMTL has 21.72 million shares outstanding. There are 2.22 million shares out short representing 10.7% of the float or 7.2 trading days worth of volume. This is significant imho using my arbitrary "3-Day" rule of short interest. No cash dividend and the latest stock split, as noted earlier, was a 3:2 split on 4/5/05. , we can see that Comtech (CMTL) has had an exceptionally strong chart, with a sharp rise from $2.75/share in April, 2002, to a peak of $26 in February, 2004. The stock sold off in May, 2004, but has traded higher since. Really a very strong stock chart! So what do I think? Well I wish I had bought it the first time I posted it :). Otherwise, the company issued a superb earnings report today, the past five years have been quite strong, valuation appears reasonable, the company is spinning off free cash flow, and the balance sheet looks solid. Finally, the chart looks great! Now, if I only had some cash to be buying stock :). Oh well. Thanks so much for visiting! If you have any comments or questions, please feel free to email me at bobsadviceforstocks@lycos.com. By the way, if you do get back to New Orleans, be sure to visit City Park where you can ride on the carousel and take in the sights and sounds of City Park. 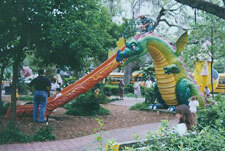 Of couse there is always Storyland for the kids! Hello Friends! Thanks so much for stopping by and visiting my blog, Stock Picks Bob's Advice. As always, please remember that I am an amateur investor, so please remember to consult with your professional investment advisors prior to making any investment decisions based on information on this website! Before talking about FedEx (FDX) I wanted to share with you one more memory of mine about New Orleans that makes the City so special. These details are the small things that add up to make the New Orleans experience so special! 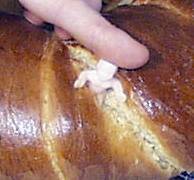 Have you ever had a piece of a King Cake? Gambino's Bakery is a major creator of King Cakes around the time of Mardi Gras. A common sight around 'break-rooms' at offices, the cake has a little plastic baby buried in the midst of the green, yellow, and purple decorated pastry. If you are unlucky enough to get the "baby", well then it is your turn to buy the next cake! Pick one up on your next visit to the 'Big Easy'! It was not a very good day in the market today. My only stocks really bucking the trend in my Trading Portfolio, were Giant Industries (GI), the independent petroleum refiner, and Cal Dive (CDIS), the offshore salvage operator. I think you can see the picture. 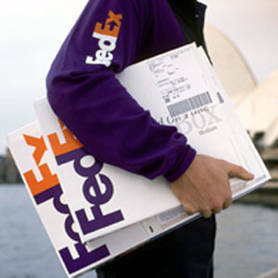 FedEx (FDX), however, moved significantly higher, making the list of top % gainers on the NYSE. 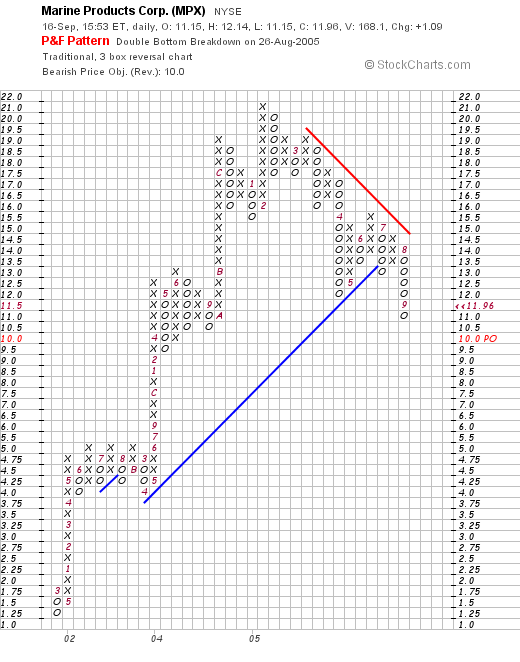 I do not own any shares of FDX nor do I have any options on this stock. FDX closed at $83.15 at the close, up $6.15 or 7.99% on the day. According to the Yahoo "Profile" on FedEx, the company "...provides a portfolio of transportation, e-commerce, and business services under the FedEx brand. 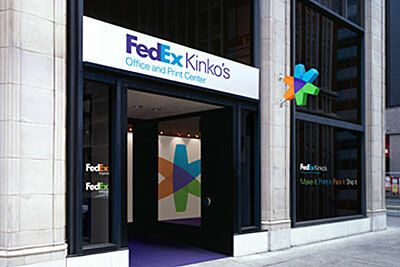 The company operates in four segments: FedEx Express, FedEx Ground, FedEx Freight, and FedEx Kinko's." What drove the stock higher today, was the company's 1st quarter 2006 earnings report. For the quarter ended August 31, 2005, revenue came in at $7.71 billion, up 10% from $6.98 billion last year first quarter. Net income was $339 million, up 3% from $330 million last year. This worked out to $1.10/diluted share, up from $1.08/diluted share last year, a 2% increase. In addition, the company raised second quarter earnings guidance to $1.30 to $1.45/diluted share, and for the year, increased guidance to $5.25 to $5.50/diluted share. This combined news was enough to push the stock higher today in an otherwise weak market for stocks. Looking longer-term at the Morningstar.com "5-Yr Restated" financials, we can see the nice, steady revenue growth from $19.6 billion in 2001 to $29.4 million in the trailing twelve monts (TTM). Earnings have increased in an uninterrupted fashion from $1.99/share in 2001 to $4.72 in the TTM. The company started paying a dividend in 2003 at $.20/share and have increased that dividend in 2004 and in the TTM to $.28/share. Free cash flow, while a bit erratic, has increased from $360 million in 2003 to $881 million in the TTM. The balance sheet is adequate, with $1.04 billion in cash and $4.23 billion in other current assets. This is enough to cover the $4.73 billion in current liabilities, with a bit left over to help offset the $6.08 billion in long-term liabilities. Looking at Yahoo "Key Statistics" on FDX, we can see that the market cap of this company is a large cap level $25.16 billion. The trailing p/e is moderate at 17.62 with a forward p/e (fye 31-May-07) even nicer at 14.00. Thus, with steady growth and a reasonable p/e we have a (5 yr expected) PEG under 1.0, at 0.90. Checking the Fidelity.com website for research for the price/sales ratio, we can see that FDX is also reasonably priced in the context of other companies in the "Air Delivery/Freight Svcs" industrial group. Leading off this group is United Parcel Service (UPS) with a price/sales ratio of 1.9, Expeditors International of Washington (EXPD) follows at 1.7, C.H.Robinson Worldwide (CHRW) is at 1.1, and FedEx (FDX) is at 0.8. Only EGL (EAGL) is cheaper at 0.4. Reviewing some additional statistics on FDX from Yahoo, we can see that there are 302.63 million shares outstanding. As of 7/12/05, there were 4.17 million shares out short, representing 1.50% of the float or 1.5 trading days of volume. This doesn't appear too significant to me, as I arbitrarily use a 3 days worth of short interest for significance. As noted earlier, the company does pay a dividend currently estimated for the year at $.32/share yielding 0.40%. The last stock split was a 2:1 split in May, 1999. 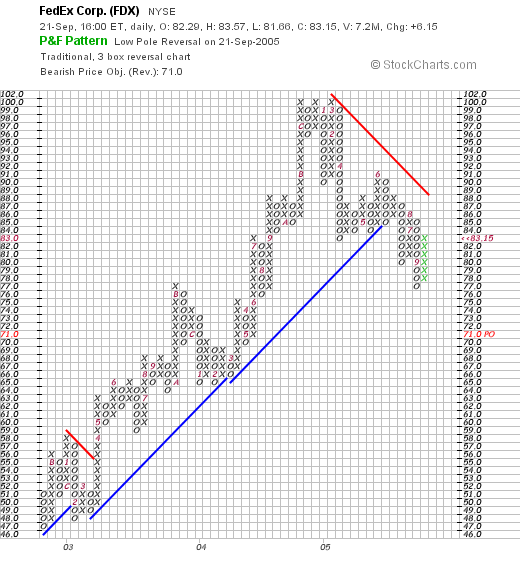 And what does the "Point & Figure" chart from Stockcharts.com on FDX look like? Looking at this price chart, we can see what starts out as what I would call a "gorgeous" chart, with the price moving steadily higher from $47 in July, 2002, to $102 in March, 2004. However, since that point, it really appears the stock may have "rolled over", especially when the support line (the blue line on the graph) was violated in June, 2005, when the stock slipped below $86/share. This stock needs to move above $89 to convince me that the price is truly moving higher once again! Graf, the CFO, cautioned during the call that Hurricane Rita -- now a Category 4 storm -- might derail FedEx's forecast if it wreaks havoc on refining facilities and drives up fuel costs. Following close on the heels of Katrina, Rita has rolled into the Gulf of Mexico with sustained winds of 135 mph. Unlike the beleaguered airline industry, FedEx and rival UPS (UPS:NYSE - commentary - research - Cramer's Take) so far have been able to weather fuel price increases by passing them on to customers in the form of surcharges. So what do I think? Well, FedEx is an interesting investment idea. I do not like the current chart short-term, as some weakness is definitely being demonstrated. I also am intuitively concerned about any company so tied to fuel prices, but apparently this has not yet interfered with growth in revenue and earnings. Otherwise, the recent quarter looks solid, valuation is nice with a PEG under 1.0, and a Price/Sales low within its industrial group. The company even pays a dividend. But I am not in the market for a stock, and even if I were, I probably would be a bit cautious around this one. 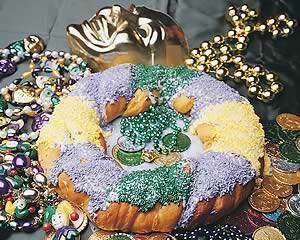 If you get down to New Orleans during the Mardi Gras, be careful when you bite into that King Cake. You wouldn't want to have to buy another cake for the rest of your friends, and you certainly don't want to choke or swallow the plastic baby! A few weeks ago, I decided to start reviewing the actual stocks in my Current Trading Portfolio. On this website, I discuss many different stocks that I view as potential investments based on my own perspective on evaluating stocks that I have discussed elsewhere. Of these stocks, I have purchased 25 different companies (the maximum # of positions in my trading portfolio) and whenever I trade a stock, I try as soon as possible to post an entry called "Trading Transparency". In this way, I can share with you my actual trading decisions along with many other stock investment candidates. Going alphabetically through my portfolio, I am still in the 'A's', and am up to American Medical Systems (AMMD). 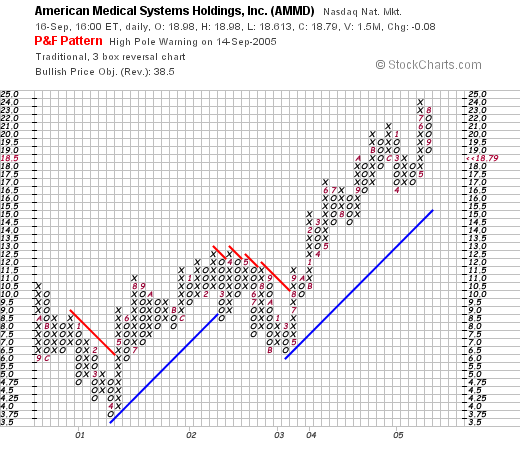 I first posted American Medical Systems (AMMD) on Stock Picks on January 9, 2004 when it was trading at $25.96. Shortly after writing the entry, I posted again and reported my purchase of 200 shares at $25.78. AMMD had a 2:1 stock split on 3/5/05 so my effective stock purchase price was $12.89. On June 24, 2004, I made my first partial sale at $32.08 for a gain of $6.30 or 24.5%. That was 1/4 of my holdings, leaving 150 shares. My next sale was on December 21, 2004, when I sold 35 shares (approximately 1/4 of my 150 share position) at $40.92, for a gain of $15.17/share or 58.8%. That left 115 shares, which subsequently split 2:1 giving me my current 230 share position. AMMD closed at $18.79 on 9/16/05, which represents a gain of $5.88 (post-split), over my cost basis of $12.91/share (including transaction costs). This is a 45.5% appreciation over the stock purchase. The stock has retraced some of its gain since the last partial sale. If the stock continues to decline, I shall be selling all remaining shares when it reaches a 30% gain (approximately $16.78/share), or selling another 1/4 position at a 90% gain (approximately $24.53/share). On July 28, 2005, AMMD reported 2nd quarter 2005 results. Sales for the quarter ended July 2, 2005, grew 34% to $65.6 million, up from $49.1 million in the same quarter in 2004. Net income for the quarter was $12.0 million, up 42% from the prior year's $8.4 million, or $.17/share, up from $.12/share last year. All-in-all a solid performance for AMMD! We can see that the chart looks quite strong with the price moving higher just above the blue "support line". American Medical Systems (AMMD) appears to be a solid part of my 25 stock trading portfolio! My future action on this stock will depend on the price movement. If you have any comments or questions, please feel free to leave them right here on the blog or email me at bobsadviceforstocks@lycos.com. Hello Friends! Thanks so much for stopping by and visiting my blog, Stock Picks Bob's Advice. As always, please remember that I am an amateur investor, so please consult with your professional investment advisors prior to making any investment decisions based on information on this website. One of the things I like to do on weekends is to take a look back at past "picks" on this website and see how they would have done if I did buy them when I "picked" them. Indeed, virtually all of the stocks in my trading portfolio come from the stocks discussed on this blog. For review purposes, I shall assume a "buy and hold" strategy for these picks. In reality, I sell my stocks quickly if they are losing money for me (an 8% loss is the sale point), and slowly at predetermined points (30%, 60%, 90%, 120%, 180% etc.) if they are making money for me. I cannot overemphasize this. The bias in selling losing stocks quickly and gaining stocks slowly is probably the most important "take-home" lesson on this blog. Regardless of how you decide to pick stocks. On 7/13/04, I posted Option Care (OPTN) on Stock Picks when it was trading at $17.39 OPTN split 3:2 on 4/1/05, making my effective stock pick price actually $11.59. OPTN closed at $13.63 on 9/16/05 for a gain of $2.27 or 19.6%. On August 9, 2005, OPTN announced 2nd quarter 2005 results. For the quarter ended June 30, 2005, revenues climbed 21% to $119 million from $99 million in the same quarter last year. Net income rose 15% to $5.4 million vs. $4.7 million last year same quarter. Diluted earnings per share increased to $.16/share for the quarter up from $.14/diluted share last year. On July 14, 2004, I posted Genzyme (GENZ) on Stock Picks at $50.06/share. GENZ closed at $72.83 on September 16, 2005, for a gain of $22.77 or 45.5%. July 14, 2005, GENZ announced 2nd quarter 2005 results. Revenue for the quarter ended June 30, 2005, increased 22% to $668.1 million from $549.6 million in the same quarter last year. GAAP net income came in at $123.6 million or $.46/diluted share, up from GAAP net income of $78.2 million or $.33/diluted share last year same period. In addition, the company also boosted guidance for 2005 revenue to $2.6-$2.8 billion, up from $2.5-$2.7 billion. It also raised guidance for GAAP EPS to $1.75 to $1.80 from $1.72 to $1.78. 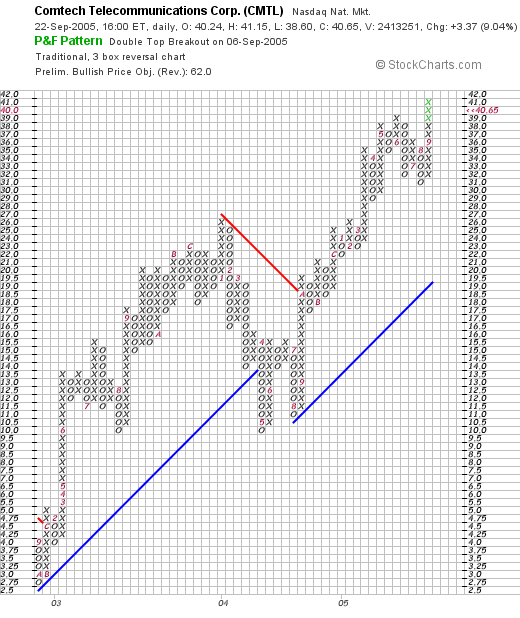 The combined strong earnings report with increased guidance 'going out' was enough to push the stock price higher! On July 15, 2004, I posted SanDisk (SNDK) on Stock Picks when it was trading at $24.96. SNDK closed at $45.71 on 9/16/05, for a gain of $20.75 or 83.1%. On July 21, 2005, SanDisk announced 2nd quarter earnings. Revenue jumped 19% to $515 million up from $433 million last year. Net income came in at $70.5 million, down from $71.8 million or $.37/diluted share, down from $.38/diluted share last year same quarter. This was ahead of estimates and the stock moved higher. I give it a "thumbs down" only because the net income and diluted EPS are down year-over-year. However, the "street" liked the report and the stock has appreciated nicely. On July 15, 2004, I posted Carlisle Companies (CSL) on Stock Picks at $66.58. CSL closed at $63.50 on 9/16/05, for a loss of $(3.08) or (4.6)%. On July 19, 2005, CSL reported 2nd quarter 2005 results. Net sales grew 9% to $645.9 million, for the quarter ended June 30, 2005, from $590.3 million in the same quarter last year. Net income for the three months was $34.7 million or $1.11/diluted share, down from $37.4 million or $1.19/diluted share last year. Finally, on July 17, 2004, I posted Masonite (MHM) on Stock Picks at a price of $24.99. MHM was acquired by Kohlberg Kravis Roberts & Co (KKR) on 4/6/05 at a price of $42.25/share (Canadian). Since as of 9/14/05, when one Canadian Dollar traded at $.8469, the buyout can be converted into $35.78, for a gain of $10.79 (US) or 43.2%. Thanks again for stopping by! If you have any questions, or comments, please feel free to leave them on the blog or email me at bobsadviceforstocks@lycos.com. 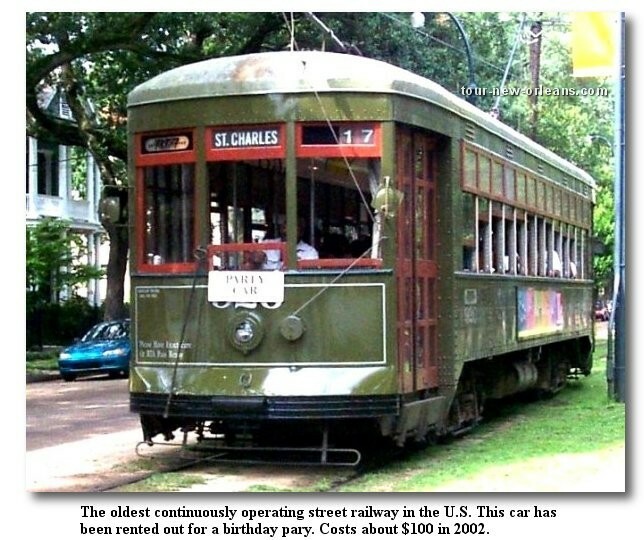 By the way, when you get down to visit New Orleans, be sure to ride on one of those famous street cars. This streetcar is a St. Charles car that has apparently been rented out for a party! A Reader Writes "I would be worried about the price of gas..."
I have never been to New Orleans, but your ongoing remembrances have me eager to visit there when it is possible. Keep up the good work of keeping this region in our thoughts. About MPX , I would be worried about the price of gas depressing the pleasure boat market. As I drive about La Crosse, I see used boats and motor homes for sale at very low prices....yet MPX numbers look promising. Perhaps there are parts of the country (such as the eastern sea board) more dependant on boats that are in need of replacement. This should be interesting to watch. Thanks so much for stopping by and visiting! You have made an excellent point over fuel prices and their possible effect on sales of pleasure boats. It is interesting that the point & figure chart on MPX there is indeed a drop in the price that I mentioned on the post...as the stock has fallen from the $20 level to the $12 level recently. Is this a result of the climbing gas prices? Perhaps. Finding people willing and able to pay $10.5 million for a new yacht is the easy part of Mac McLaughlin's job. The hard part: finding people willing and able to make the yachts. McLaughlin is the chief financial offer of Broward Marine, a yacht manufacturing and repair business in Fort Lauderdale. 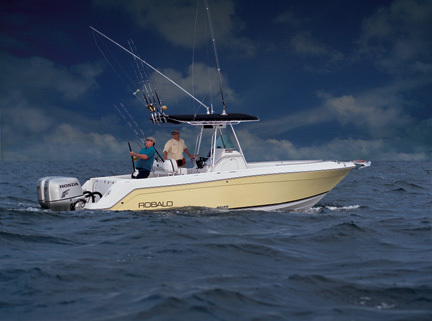 A declining dollar against the euro and an aging population with lots of disposable income make these busy times for Broward Marine and others in South Florida's marine industry. ''There's a heck of a lot of millionaires out there,'' McLaughlin said. He says he'll have to triple or quadruple his workforce over the next nine months to keep up with increased demand. At the other end of the spectrum, Jim Galway, sales manager at Watertower Marina Inc. in McHenry, said soaring temperatures, skyrocketing fuel prices and low water levels had hurt summer business. "It has not been a terrible year, but we definitely are not up to par as far as people buying, using and servicing their boats," Galway said. "It might have been too hot for some people to bother coming out. "Gas prices have hurt. When some people starting hearing rumors of how high prices were going to go, and did go, they did not bother to come out to buy a boat and use the boat they already had. "Some canals were low, so people were worried about damage to their boats. We have not fixed a lot of boats. Either there has not been much damage or people have yet to fix their boats." At Fox 14 Marina near the Fox River in Fox River Grove, manager Garry Zack said business this summer has been "very good." "We were closed until the Fourth of July in 2004 because we had so much rain they had to close the river," Zack said. "Last year was bad. This year is much better. 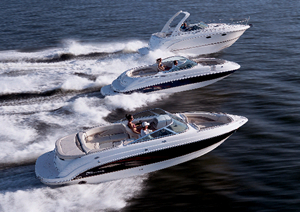 "The boaters love the hot weather. For those of us working in the shop all day with no air conditioning, it was brutal." The high cost of gas has not deterred boaters at Fox 14 Marina, Zack said. "More people commented about gas prices last year, even though they are higher this year," he said. "When we finally rolled to $3 a gallon in mid-August, only one customer complained. "Gas prices are 10 to 15 cents higher on the waterway because we do not buy in bulk. We have kept our prices as low as we could. I think the boaters understood the situation." Even with the summer boating season winding down, Watertower Marina has not dropped anchor on its business prospects just yet. "Just recently boat sales started picking up," Galway said late last month. "Hopefully that will continue to make up for some of the slow periods we had earlier in the season that we should not have had. "And maybe some people are waiting for the fall to service some of their boats that might have been damaged by the low canals." Thus, I am not sure whether the price of gas has definitely impacted boat sales overall. Certainly in some areas of the country where the local economy may not be as strong and the disposable income may not be as great, sales may be impacted. However, since many boats, especially the more expensive boats and yachts, may have upper-income purchasers who are less affected by fuel prices, this may not be a factor for those sales. Thanks so much for the note. Time will tell whether the gas prices will be affecting sales at a company like MPX. You have made some excellent points and we may be seeing this in the future. Before I discuss Marine Products (MPX), I wanted to continue my discussion of things that I feel make New Orleans special. As we consider the cost of reconstruction and rehabilitation of the city, let us recall the many things that make this imperative. Needless to say, music and Jazz are an essential ingredient to the New Orleans experience. 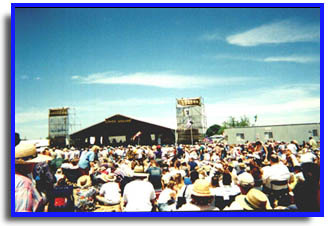 A photo of the New Orleans Jazz & Heritage Festival. If you love jazz, gospel, cajun, zydeco, rythm and blues or just about any type of music, a great time to visit New Orleans is during the last week of April and the first week of May. This is the time the annual New Orleans Jazz & Heritage Festival is held. Second only in size and fame to Mardi Gras, in a city that hosts a great number of parties, the Jazz Fest has become both a major international musical and cultural event. The festival takes place at the New Orleans Fairgrounds horse racing track and includes not only performances by hundreds of top musicians, but an enormous display and offering of South Louisiana and New Orleans crafts and food. If anything is able to rival jazz and the music of New Orleans in popularity, its the incredible selection of creole, cajun and crescent city cuisine. So be sure to visit New Orleans, and if you can, take in the Jazz & Heritage Festival as soon as it gets going once again! Looking through the list of top % gainers on the NYSE this afternoon, I came across Marine Products, which as I write, is trading at $12.10, up $1.23 or 11.32% on the day. I do not currently own any shares or options on this company. I first posted Marine Products (MPX) on Stock Picks on February 18, 2004, when it was trading at $20.00/share. MPX had a 3:2 split March 11, 2004, and another 3:2 split on March 11, 2005. Thus, the effective pick price was actually $8.89. With the current price at $12.10, this represents a gain of $3.21 or 36.1% since the original post. According to the Yahoo "Profile" on Marine Products, the company "...engages in the design, manufacture, and sale of fiberglass motorized boats in the United States. 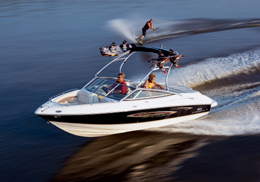 The company's product offerings include sterndrive and inboard-powered sportboats, deckboats, and cruisers, as well as outboard sport fishing boats." On July 27, 2005, MPX reported 2nd quarter 2005 results. For the quarter ended June 30, 2005, net sales grew 19.7% to $77.6 million from $64.8 million last year. Net income for the quarter came in at $8.0 million, up 24.4% from the $6.4 million the prior year same quarter. On a diluted earnings per share basis this came at $.20, a 25% increase over the $.16 reported the prior year same quarter. Looking longer-term at a "5-Yr Restated" financials from Morningstar.com, we can see the nice, steady picture of revenue growth (except for a dip between 2000 and 2001) from $148 million in 2000 to $276 million in the trailing twelve months (TTM). Earnings have increased from $.33/share in 2002 to $.64/share in the TTM. Since 2001, the company has been paying a small dividend, increasing each year from $.01 in 2001 to $.13/share in the TTM. Free cash flow has been positive, growing from $8 million in 2002 to $23 million in the TTM. As reported by Morningstar, the balance sheet for MPX is gorgeous with $46.7 million in cash, more than enough to pay off both the $22.6 million in current liabilities and the $5.7 million in long-term liabilities with $14 million or so still left over! In addition, the company has reported $42.2 million in other current assets. Looking at Yahoo "Key Statistics" on Marine Products, we can see that this is a small mid-cap stock with a market capitalization of $459.32 million. The p/e is downright reasonable at 18.41, with a forward (fye 31-Dec-06) p/e even nicer at 14.94. Confirming the nice value of this stock, the PEG (5 yr expected) is under 1.0 at 0.82. MPX is in the "Recreational Vehicles" industrial group according to my Fidelity.com research. Within this group, they are midway priced in valuation insofar as the price/sales ratio is concerned. Harley-Davidson (HDI) tops the group with a price/sales ratio of 2.8. This is followed my Marine Products (MPX) at 1.6, Polaris (PII) at 1.2, Winnebago (WGO) at 1.0, Thor (THO) at 0.8 and Monaco Coach (MNC) at 0.4. Looking again at Yahoo, we can see that there are 38.44 million shares outstanding with 446,490 shares out short as of 7/12/05. This is a bit significant due to the relatively low trading volume of this stock, and these shares represent 3.50% of the float or 7.1 trading days of volume. As noted earlier, the company pays a small dividend of $.16/share yielding 1.50%. And as I also discussed, the stock split last 3/11/05 when a 3:2 split was declared. We can see that the stock has traded sharply higher from February, 2001, when it was at the $1.25 level, and hit a peak in February, 2005, at the $21 level. The stock actually broke through resistance at $13.50 in July, 2005, and now is moving higher, but still below the "resistance" line. The graph gives me some pause at least short-term! So what do I think? Well, I wish I bought some of these shares the last time I discussed this company :). However, at this time, the last quarterly report was solid, the past five years, while not perfect, were quite strong, valuation is reasonable with a PEG under 1.0, and the price/sales is also moderate. There are a lot of shares out short which may add a possible upward price pressure to this stock. On the downside, the chart is a bit weak. The company has just announced a stock buy back which may change the picture significantly. And I am not sure of the impact hurricane Katrina may have on this company, as presumably, damaged boats are replaced with new purchases (?). 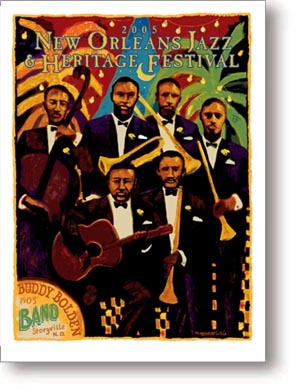 And if you do get down to New Orleans for the Jazz & Heritage Festival, please remember to pick up a poster for me!